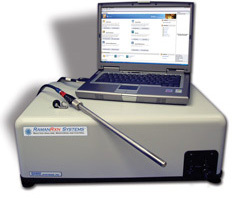 The RAMANRXN1™ instrument represents Kaiser's instrument for research. Based on Kaiser's award winning f/1.8 axial transmissive spectrograph, this instrument is a compact, easy to use, turn-key Raman spectrometer system that incorporates the laser, spectrograph, and CCD in a compact base module. The f/1.8 design is optically efficient and allows more than six times the light to be collected than traditional spectrograph designs. In conjunction with a high-performance CCD detector and Kaiser's proprietary HoloPlex™ grating technology, the RAMANRXN1™ spectrometer is capable of providing fast, simultaneous, full spectral collection of Raman data at high spectral resolution. Kaiser’s Raman analyzers combine Raman filters, rugged spectrographs, high performance CCD detectors, compact NIR or VIS lasers, and fiber-optic Raman sampling probes to produce a quantitative Raman-based chemical sensor. Sampling optimization is provided by utilizing high-performance fiber-coupled accessories: the AirHead™ for gas-phase monitoring, the MR Probe probe head for in situ liquids or non-contact solids monitoring, the MK II Probe Head for Raman depolarization ratio studies, the Raman Microprobe for sample visualization, mapping, or imaging, and the Analytical Sample Compartment for routine laboratory or quality assurance purposes. (width × length × height) 23" × 17.63" × 8"